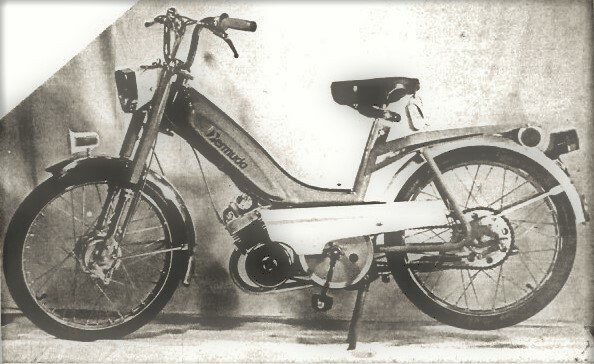 Bermuda mopeds are made in Belgium by Flandria. They are called Flandria in Europe. 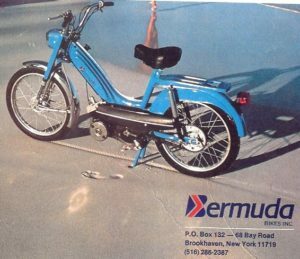 In 1976-77 they were imported into the USA by Bermuda Bikes, Inc. first at 606 Ocean Ave, Point Pleasant, NJ 08742, then at 301 Locust Av Oakdale, Long Island, NY 11769, and then at 68 Bay Rd Brookhaven NY 11719. 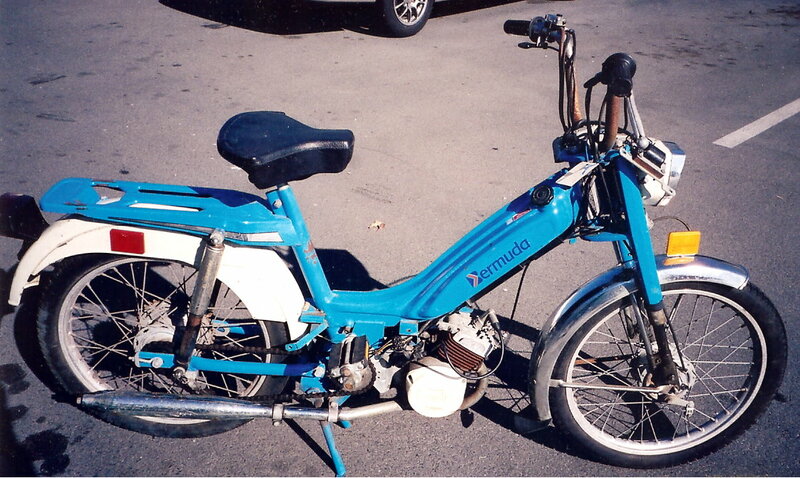 Many were sold on the island of Bermuda, where they replaced the Motobecanes that ruled there in the 50’s and 60’s. 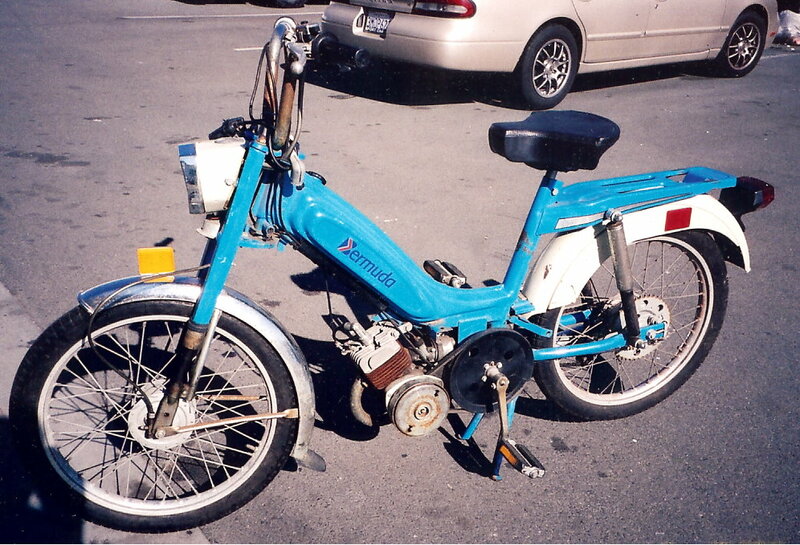 In 1978-79 Bermuda mopeds were distributed on the west coast by ZSN, at 351 S Raymond Av Fullerton CA 92631. 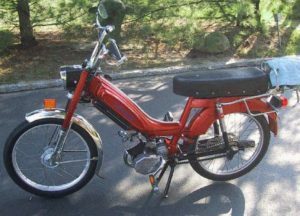 ZSN also distributed Demm mopeds, only 2 miles from Myrons Mopeds. 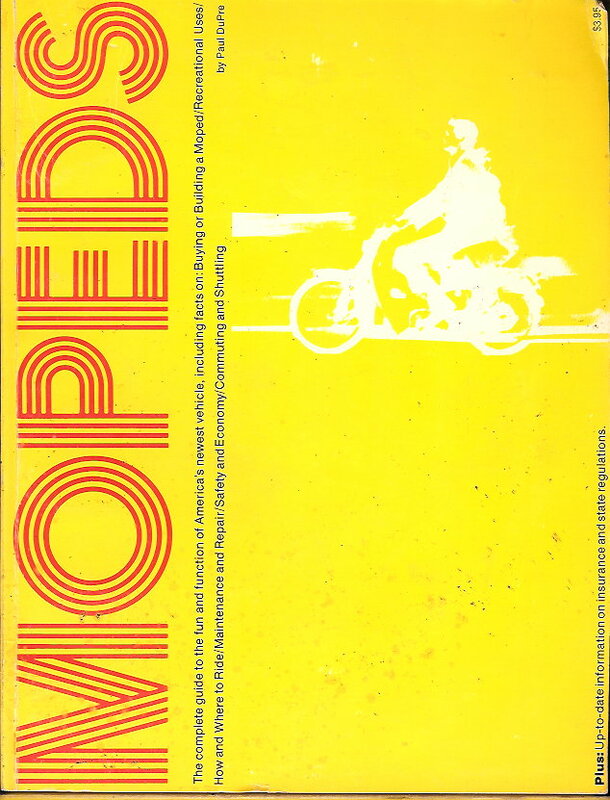 Here is an article about Bermuda mopeds from the 1977 book “Mopeds” by Paul Dupre. About 150 years ago a Flemish blacksmith named Alexander Claeys, in Zedelgem, Belgium, was busy doing his thing when suddenly he became quite ambitious and founded a company known as A. Claeys Flandria. The family firm repaired, renovated and built a wide range of metal products. In 1896 the company went into the bicycle manufacturing business and after World War II added motorized bicycles to it’s line. The company produced 25,000 mopeds in 1950 – it’s first year of moped production. The plant’s assembly line now has a capacity of 300 motorized bicycles a day. The firm has stayed a family concern – the president is now Mr. Paul Claeys. In addition to their popularity in Europe, Bermuda mopeds are familiar to tourists to that island paradise and for many years these handsome and economical vehicles have been praised as the best, most leisurely, least exhausting way to see and feel the charm of Bermuda. The moped makes Bermuda’s many scenic hills and dales child’s play to people who couldn’t tackle them on an ordinary pedal bicycle. The cost of renting a moped and buying fuel for it in Bermuda makes this by far the most economical way of seeing the island, as well as the most pleasurable. The Robert Bosch people have provided a magneto with sufficient generating capacity to meet the needs of the NHTSA-required sealed beam head-light, the stop light, tail light, electric horn, and ignition system on units imported into the USA. The 49cc engine, made by the Belgian company, Flandria, is a single-cylinder two stroke motor with a cast iron cylinder, chrome alloy piston, and carefully balanced roller bearing crankshaft. 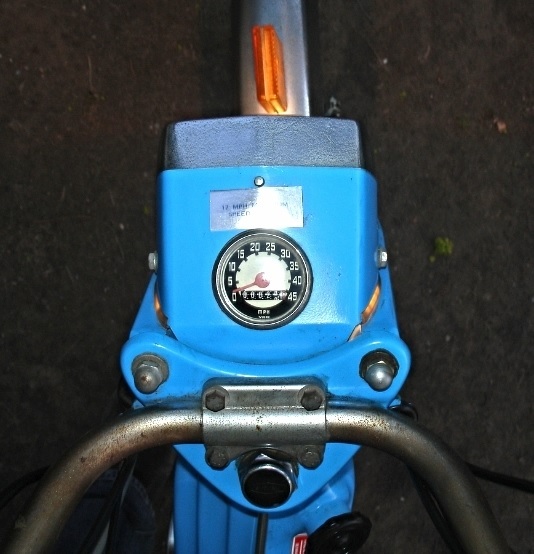 The engine is mounted ahead of the pedal crank and provides a very low center of gravity. As with most mopeds, you use the pedals to get the engine started and to give it a little extra help on hills. The engine drives the unit through a dual centrifugal clutch – the inner clutch is connected to the rear wheel and is thus activated by forward motion, while the outer clutch is connected to the engine and is brought into action by engine rpm’s. As you pedal to get started (either by moving along or while the vehicle is still on the stand) the inner clutch pads expand and transfer rotary motion to the outer clutch attached to the engine. With the decompressor open, there is sufficient drag to turn over the engine. Closing the decompressor permits the engine to fire on compression and start up. When the engine is idling, there is not enough centrifugal force being generated to activate the outer clutch so there is no forward movement. 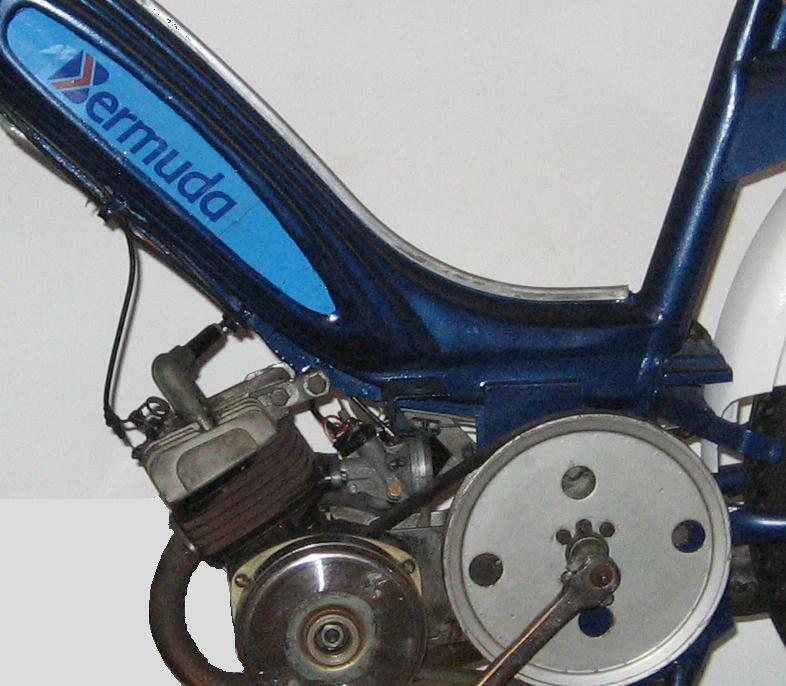 To start off your Bermuda (as with most other mopeds) after pedaling a short distance, you open the handlebar throttle and the increased rpm causes the outer clutch to become engaged. As you slow down to stop, the outer clutch automatically disengages as wheel revolutions slow down and the engine is back to the idling mode. Bermuda is a marketing name for Flandria mopeds originally sold in the USA. Bermuda models are named after places in Bermuda. 1976-77 Bermuda Hamilton (Flandria Carina) 2-cycle engine, 49.7cc, with a 7.5:1 compression ratio. Maximum speed: 25mph and the machine is designed to climb an 11.7 percent grade without pedaling. Transmission is one-speed dry centrifugal clutch and v-belt. The engine delivers approximately 133 miles per gallon and produces 1.4 maximum horsepower at 5500 rpm. Carburetor is Encarwi S33. The tank holds one US gallon. Fuel is regular gasoline and oil mixture (4 percent oil). Frame is pressed steel, and the unit has telescopic front forks and rigid rear forks, a “hard tail”. Wheelbase 43.3 inch. The wheels have drum brakes front and rear. Tires are size 2.00-17. Net weight of the Hamilton is 92 lbs. Equipment includes Bosch magneto-generator, sealed beam adjustable headlight, 10 watt stoplight, 5 watt tail light, electric horn, Bosch W145T1 spark plug (NGK B6HS), tool kit, safety flag. Color is blue with white trim. 1976-79 Bermuda Hampton (Flandria 147FA): All specifications and equipment for the Hampton model are the same as for the Hamilton with the exception of an added speedometer/odometer, a swinging-arm type rear suspension with shock absorbers, steering column lock, wheelbase 44.0 inch, a 97 lb net weight, and tires 2.25-17. Both the Hamilton and the Hampton are available in lower power and lower speed versions where required by state laws. 1976-77 color is aqua blue with white trim. 1977 color is aqua or dark blue with white and black trim. 1978-79 colors are aqua blue, silver, cinnamon, green, orange. 1976-77 had white rear fender, white metal covers, gray pulley. 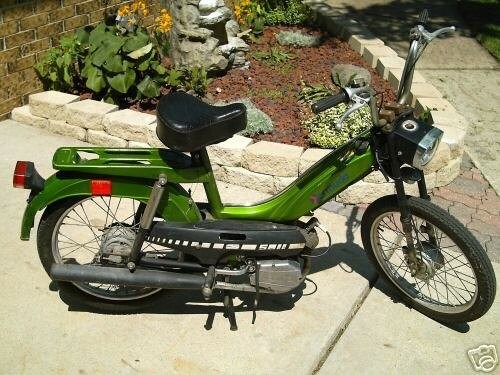 1978-79 had painted rear fender, black plastic covers, black pulley. 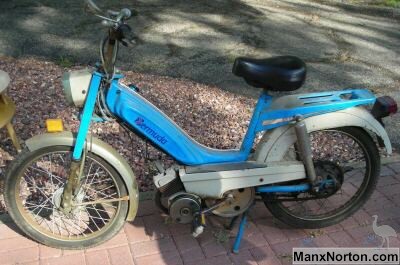 1978-79 Bermuda Somerset (Flandria 147FVA): Same as Hampton but with a dry clutch variator v-belt transmission. 1978-79 Bermuda Pembroke (Flandria 147AFA): Same as Hampton except for different engine with one speed oil bath centrifugal clutch transmission, kick-back starting (like Tomos). Same Encarwi S33 carb, but different Dansi magneto 6V 30/18W, same 2.25-17 tires, more weight 100 lbs. Magura (made in Germany) controls 1970’s wrap-around throttle, choke trigger on right thumb, decompression trigger on left thumb. VDO (made in Germany) small type speedometer. VDO left side driver. VDO cable 2.0mm square inner, M10x1 thread on both end caps. The bikes only go 25 (or 20) mph on level ground, but the speedometer goes up to 40 or 45. Gas valve: is a vertical type used in the sideways position, a Karcoma (made in Germany) 1970’s “early” style petcock, 12×1 spigot right. It had no reserve. Cables same brake cables as 1977-79 Sachs (Hercules) double pear-end. Brake plate arms have the clevis piece riveted on, like 77-79 Sachs. 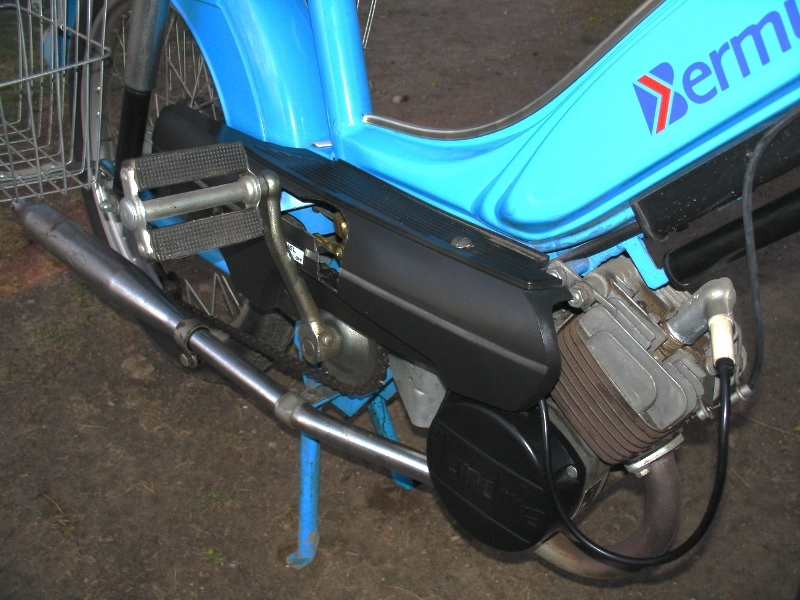 The rear brake plate is anchored by a welded post, like Sachs (unlike KTM which is clamp-on). Grimeca (made in Italy) hubs with 90mm brake drums, 2-chain rear, like Sachs. ULO (made in Germany) “early” type 2-bulb tail light. Top 6V10W brake light, bottom 6V5W tail light. Flandria engine, dry clutch, belt drive, bore 40.0mm. Encarwi (made in Holland) S33 carburetor. Both engine versions have the same top end (piston, cylinder, and head). The design is unique and unusual. The upward fresh intake flows from the crankcase, through the middle of the piston, and then out through short transfer ports and back in above the piston. Most two strokes have long transfer tunnels that go around the sides of the cylinder, like the long handle of a beer mug, to get from below the piston to above it. Flandria engine, wet clutch, gear drive, bore 40.0mm. Flandria rims: All three Flandria models have 17 inch spoke wheels. The hubs and brakes are same as on Sachs-Hercules mopeds, Grimeca 2-chain stamped steel. The Hamilton has steel rims. But the Hampton and Pembroke have aluminum rims, made in Switzerland by Wienmann. 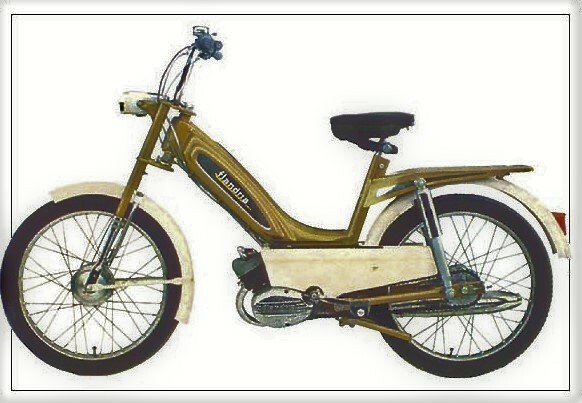 These are the only US-model mopeds with aluminum spoke-type rims. Too bad. You are currently browsing the archives for the Flandria category.